Left handed pitcher Michael Stone pitched three strong innings. King bounced back with a 9-3 win against Spoto Saturday to show no hangover after suffering their first loss of the season to Hillsborough earlier in the week. It was a contest with many miscues on both sides, and the difference was King’s ability to take advantage of scoring opportunities when the chance arose. The Lions (4-1) drew first blood in the bottom of the first inning. Leadoff hitter Seyjuan Lawrence hit a single, stole second and scored on a sacrifice from Justice Thompson. After Matt Jernigan drew a base on balls he also scored in the first on two errors by the Spartans defense. Left-handed pitcher Michael Stone was first on the hill for the Lions mixing fast balls and breaking balls to keep the Spartans at bay. It was not until the third inning when he gave up the first run of the game for Spoto. Stone walked two and hit a batter and an error by the King defense allowed the run to cross the plate. “The team didn’t play like they are capable of playing, even though we got the win,” said manager Jim Macaluso. 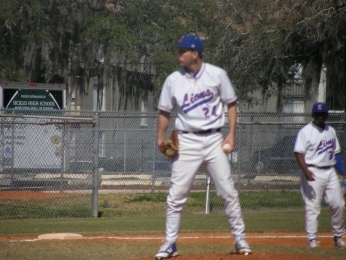 Macaluso went to right-handed pitcher James Erickson to settle things down for the Lions. Erickson came in and finally got the third out of the inning to end the Spartans threat. Lawrence then added one more run in the second inning on an error and a wild pitch. Erickson shut the Spartans down with a 1-2-3 inning in the fourth on good pitching that Spoto couldn’t do anything with. Desmond Williams pitched well in a losing effort. Spoto starter right handed pitcher Desmond Wilson was making good pitches but luck was not on his side today against the Lions. King scored three more runs in the third inning with left fielder Justice Thompson reached on a walk, stole second and scored on an error which also allowed Matt Jernigan to reach to third on the play. Colby Barnum became the next Lion to reach base on error when the Spartan outfield dropped a fly ball. Jernigan came into score on a sacrifice by Jemarcus Lyons. Barnum scored on an RBI double by second baseman Anthony Azpeitia. 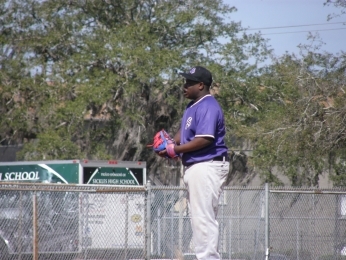 Spoto (1-4) managed to score two more runs in the top of the fifth inning on a single by first base man Michael Gibbs. But then it was time to go to Jamarcus Lyons, who came in and shut the door by striking out seven Spartans in the final three innings. King added three more runs to pull away.